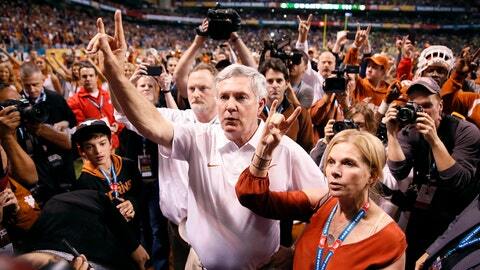 Texas coach Mack Brown sings the school song after the game against Oregon Ducks at Alamo Dome. Oregon defeated Texas 30-7. Blame backdoor politics. Maybe you’d like to believe the 16-year itch explains it. Monday night’s Alamo Bowl was Mack Brown’s final game as Texas’ coach, and for 60 minutes, the reason why was only slightly less conspicuous than the bright green numbers and wings on Oregon’s uniforms. Quarterback Case McCoy accounted for 39 yards of offense and one touchdown for Texas, and 75 yards and two touchdowns on two interceptions for Oregon. Game over. Oregon 30, Texas 7. Monday night showed what recruiting rankings and NFL Drafts have told us for much of Brown’s tenure at Texas: The Longhorns are talented and Brown’s successor will have plenty to work with. As long as he finds a quarterback–and fast. The defense held Oregon to one offensive touchdown for the first time since 2010, but McCoy’s pair of pick sixes deep-sixed any chance Texas had of springing an upset as a two-touchdown underdog. Blue-chip running back Malcolm Brown pounded Oregon’s front seven for 130 yards on 26 carries, including a career-high 40-yard run. Defensive end Jackson Jeffcoat earned a sack and forced a fumble from quarterback Marcus Mariota, who rushed for 130 yards in the first half but had just four in the second half on a gimpy leg that altered Oregon’s playcalling and kept him caged in the pocket. Texas’ receivers and tight ends came up with an untimely case (as opposed to timely, I suppose), but Texas’ deficiencies at quarterback were a sadly fitting goodbye to Brown, who deflected attention from his farewell all week to his players. "We couldn’t move the ball as well as we needed to," Brown told reporters. He was talking about the Longhorns’ 236-yard performance against the Ducks, but he might as well have been referencing his offense for the last four seasons. Seeing Brown on the sideline, bringing an offense to San Antonio far from capable of keeping up with Oregon’s speedy attack left me wistful, remembering Brown’s finest moment in 2005 when Vince Young carried the Longhorns to a national title against USC, who boasted one of the best offenses in college football history with Reggie Bush and Matt Leinart. Missing on Garrett Gilbert in 2010 was part bad luck, part bad development, but Brown was caught unprepared for him to not join Young and Colt McCoy as the next great Texas quarterback. David Ash proved himself as an above average quarterback, but a recurring head injury this season left Texas to roll with Case McCoy. He’s had his moments as a Texas quarterback (hello Oklahoma and Texas A&M), but his final game showed why his final game will also be Brown’s finale. Texas needed an all-world QB to win both of Brown’s Big 12 titles and didn’t look like anything close to the Big 12’s best team at any point after Gilbert’s career at Texas ended with a transfer to SMU in 2011. Just as he did in his resignation press conference, Brown kept his emotions in check, cracking a few jokes about checking game tape on Tuesday morning and not wanting his players to find trouble in public after the game. Still, it was hard to shake the pall over an ending to the Brown era that was anything but dramatic. There was no legendary comeback. No opportunities for Gatorade baths or being carried off the field. Just a long walk through the Alamodome tunnel to the locker room and when he gets back to Austin, an office to vacate.